Have you ever wondered how to encourage creativity in your students? The Montessori method, as usual, has a different approach. I believe I have heard Montessori education criticized for its supposed lack of creativity. And if paper crafts from Pinterest = creativity, then I guess it is lacking. But, really, creativity means the ability to make something new. And the way we get there in early Montessori education is by caring less about the final product, and more about the process the child goes through. Because if we’re making all the three-year-olds in our classroom crank out the same Van Gogh inspired paint project, they’re not really making something new. They’re not being creative. I think that, to a lot of us, this makes sense. But for some reason it doesn’t really play out in most pre-schools. “Art time” is the perfect example. But those crafts are so fun and cute! And the parents love them! I totally get it. But here’s what we’re missing out on when we emphasize cute crafts over real creativity. Externally, we see that she paints for as long as she wants. She might repeat the same strokes long past when we think it looks “done,” and cover the whole paper blue. Or she might paint two small shapes in the corner and decide that’s good enough, long before it looks “done” to us. The result may or may not be fridge worthy, but that’s not what matters. In other words, she is building her mind through her actions. She is building her will, by choosing when and what to paint. She is building her personality, by expressing something she took in from her environment. She is working out and clarifying all those little impressions living in her brain. This isn’t just nice. It’s necessary. I hear you, the child does develop by gluing things where we tell him to glue them. He is still working with his hands, and that’s good. But the deeper development only happens if he willingly glues them, and you don’t interrupt him. Not very conducive to completing that craft just as you envisioned it. By allowing the child to carry out his own creative work, we give him the freedom to build his mental powers. He develops focus and concentration. He begins experimenting, or following an idea in his own mind. Do we really want to sacrifice that for a cute project we found on Pinterest? I’m not saying you can never do a craft project with your students. But shake off the pressure to do one every week, or even every month. Ask yourself, “who is this for? Is it for the students, or for the parents?” I can tell you right now, the students don’t need the crafts. They need more opportunities for process, without worrying about the result. One of the biggest objections to eliminating crafts is this: crafts are good because they give kids a model to follow. Crafts show them how to use techniques to get a certain effect. They give kids limits and guidelines to follow. They teach that discipline gives good results. The good news? 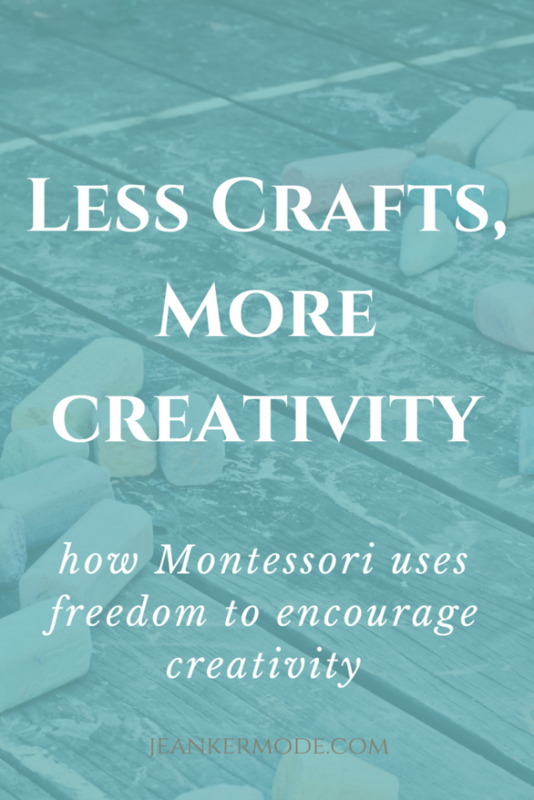 Techniques, limits, and discipline do play an important role in the Montessori approach to creativity. Basically, there are two components to encouraging creativity: freedom + limits. Today, we talked about how important freedom and process are for encouraging creativity. In this post, I go over limits, discipline, and techniques and show you a different way to use them. It’s super cool. And now, I want to hear from you! Would you be sad to give up doing crafts with your students? Or is this the excuse you’ve been waiting for? Let me know in the comments!